Thinking about promoting spoken language among your students? Videochat is one of the tools developed by SpeakApps which consists of an easy-to-use videoconferencing system designed for the specific needs of small groups work -up to six people-, allowing also messaging and video recording. 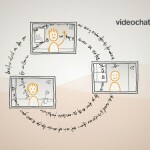 You can get more information about how Videochat works in the short video below. Try out the videochat tool in the demo version ubicated in the SpeakApps Moodle platform!